When fans go to the movies, they want to do more than just see a movie – they want to experience it. With competition from both in-home and on-the-go offerings on the rise, IMAX leverages Coyne to educate audiences on why choosing to experience a movie in IMAX is the only way to truly become part of the action. 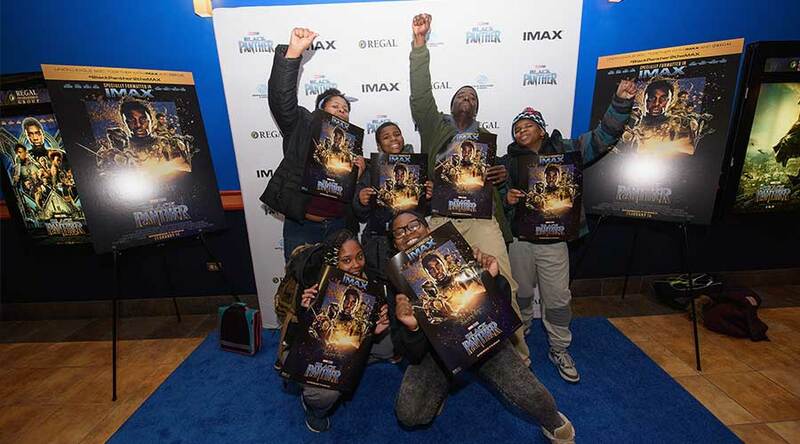 As part of the viral #BlackPantherChallenge campaign, IMAX, Regal Entertainment Group, Walt Disney Pictures and Marvel Studios, hosted an advance IMAX screening of Black Panther for Boys & Girls Club (BGC) members in Houston, TX; Chicago, IL; Long Beach, CA; and New Rochelle, NY. The Coyne team brought the #IMAXUPGRADE to life when unsuspecting Godzilla fans at AMC Lincoln Square 13 in New York City got a surprise of monstrous proportions. Just before the opening trailers began on a standard 2D showing of the box office hit, host Peter Shankman and a street team sporting IMAX blue instantly upgraded everyone in the audience and invited them to see Godzilla in the world’s most immersive format – IMAX® 3D. IMAX officially launched its new technology at the world famous TCL Chinese Theatre IMAX in Hollywood – the first theatre in the United States to feature this groundbreaking laser system. The launch event gave media an unprecedented behind-the-scenes look at IMAX with laser, which included an in-depth technology demonstration, tour of the projection booth, and one-on-one interviews with IMAX and TCL executives. To announce the launch of IMAX's new 3D Digital Camera in conjunction with the summer blockbuster film Transformers: Age of Extinction that debuted in theaters nationwide, Coyne took a two-phased approach to the announcement. First, the team identified a select number of tech, mainstream and film outlets to provide advances to under embargo to encourage more feature-driven stories about the technology. Then, the team developed an SMPR that was shared widely across the IMAX media universe. During the NFL draft, Coyne Public Relations took notice of first round draft pick Ziggy Ansah’s realD 3D glasses and capitalized on the fashion statement and the IMAX 3D connection. Coyne developed an offer letter to Ansah on behalf of IMAX to see all IMAX movies on behalf of the company for the next year and pitched the letter to key sports media.